Although President Obama has made fewer recess appointments than any president in the last 40 years, the GOP pretended to be outraged by the President’s appointment of Richard Cordray to lead the Consumer Financial Protection Agency. The President said he was fed up with the GOP stalling his nominee to lead a new consumer protection agency in order to prevent protections being enforced. “I refuse to take `no’ for an answer,” the president said. Obama announced the move with Cordray by his side before a cheering crowd in Ohio, a politically vital state where Cordray once was attorney general. Obama mentioned why he was making the appointment now even though Cordray was nominated last summer. He cited Senate Republican opposition who refused to give Cordray an up-or-down vote, despite the fact he has the support of the Senate majority. With a director in place, the new Consumer Financial Protection Bureau will be able to start overseeing the mortgage companies, payday lenders, debt collectors and other financial companies often blamed for practices that helped tank the economy. The president announced three other appointments to the Labor Relations Board – another government agency that the GOP opposes. Until now, President Obama has made only 28 recess appointments. Bush made more than 170 during his presidency. Bill Clinton made almost 140. This entry was posted in Economy on January 4, 2012 by Maui Democrats. Every time I try to make sense of Re­pub­li­can tax doc­trine I get lost. For ex­am­ple, rank-and-file House Re­pub­li­cans are will­ing to in­crease taxes on the mid­dle class start­ing in a few weeks in order to avoid a tax in­crease the very rich. Here are the de­tails: The pay­roll tax will in­crease 2 per­cent start­ing Jan­u­ary 1 – cost­ing most work­ing Amer­i­cans about $1,000 next year – un­less the em­ployee part of the tax cut is ex­tended for an­other year. This means some­one who earns $1,000,001 would pay just under two cents extra next year, and 19 cents over ten years. Rel­a­tively few Amer­i­cans earn more than a mil­lion dol­lars, to begin with. An ex­quis­itely tiny num­ber earn so much that a 1.9 per­cent sur­tax on their earn­ings in ex­cess of a mil­lion would amount to much. Most of these peo­ple are on Wall Street. It’s hard to find a small busi­ness “job cre­ator” among them. Nonethe­less, Re­pub­li­cans say no to the sur­tax. “The sur­tax is some­thing that could very much hurt small busi­nesses and job cre­ation,” says John Kyl of Ari­zona, the Sen­ate’s sec­ond-rank­ing Re­pub­li­can. This puts Re­pub­li­cans in the awk­ward po­si­tion of al­low­ing taxes to in­crease on most Amer­i­cans in order to avoid a small, tem­po­rary tax only on earn­ings in ex­cess of a mil­lion dol­lars — mostly hit­ting a tiny group of fi­nanciers. Not even a res­olute, doc­tri­naire fol­lower of GOP pres­i­dent Grover Norquist has any basis for pre­fer­ring mil­lion­aires over the rest of us. To say the least, this po­si­tion is also dif­fi­cult to ex­plain to av­er­age Amer­i­cans flat­tened by an econ­omy that’s taken away their jobs, wages, and homes but con­tin­ues to con­fer record prof­its to cor­po­ra­tions and un­prece­dented pay to CEOs and Wall Street’s top ex­ec­u­tives. So Re­pub­li­can lead­ers are try­ing to get rank-and-file Re­pub­li­cans to go along with an ex­tended pay­roll tax hol­i­day — but by pay­ing for it with­out rais­ing taxes on the very rich. Ac­cord­ing to their lat­est pro­posal, they want to pay for it mainly by ex­tend­ing the pay freeze on fed­eral work­ers for an­other four years — in ef­fect, cut­ting fed­eral em­ploy­ees’ pay even more deeply — and in­creas­ing Medicare pre­mi­ums on wealthy ben­e­fi­cia­ries over time. 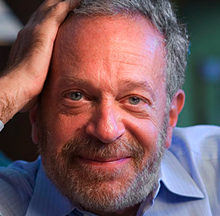 But even this pro­posal seems odd, given what Re­pub­li­cans say they be­lieve about taxes. For years, Re­pub­li­cans have been telling us tax cuts pay for them­selves by pro­mot­ing growth. That was their ar­gu­ment in favor of the Bush tax cuts, re­mem­ber? So if they be­lieve what they say, why should they worry about pay­ing for a one-year ex­ten­sion of the pay­roll tax hol­i­day? Surely it will pay for it­self. 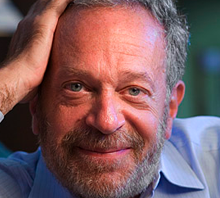 This ar­ti­cle was orig­i­nally posted on Robert Reich’s blog. This entry was posted in Economy on December 6, 2011 by Maui Democrats. This entry was posted in Economy on December 5, 2011 by Maui Democrats. 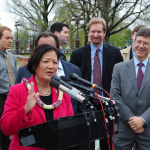 This entry was posted in Economy, Jobs on November 21, 2011 by Maui Democrats. Note from webmaster: Virtually all agree that a small transaction tax on stock trades will be an effective way to stabilize the stock market and discourage the high speed computer trading that is destabilizing the the market and hurting pensions and smaller investors. High speed computer trading is Day Trading on steroids that pulls $billions of dollars out of the stock market a fraction of a cent at a time. But since this is done in microseconds by computerized trading of huge quantities, it adds up. It is thought that a mistake in this high speed computerized trading was responsible for the 1,000 point drop in the Dow last year that happened in less than an hour. 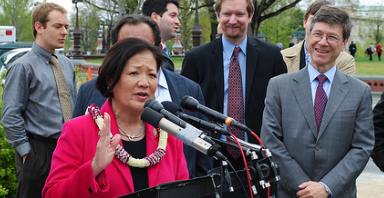 WASHINGTON, D.C. – Mazie Hirono signed on to Senator Tom Harkin’s (D-IA) legislation to place a tax on certain trading activities undertaken by banking and financial firms. The measure does not harm long-term investing, but instead raises the greatest revenue from rapid financial trading and complex transactions undertaken by financial and investment firms. Joining Harkin and Braley in cosponsoring the legislation were Senators Bernie Sanders (I-VT) and Sherrod Brown (D-OH) along with Congressmen Peter DeFazio, Hank Johnson, John Sarbanes, Bob Filner, Betty Sutton, Earl Blumenauer, Louise Slaughter, Mazie Hirono, Peter Welch, John Conyers and Maurice Hinchey. “Wall Street got us into this economic mess — they should help get us out,” Braley said. “While Iowa and the rest of America are left dealing with the consequences of their actions, Wall Street’s back to bagging record profits. That’s not right. The measure will place a small tax of three basis points (3 pennies on $100 in value) on most non-consumer financial trading including stocks, bonds and other debts, except for their initial issuance. For example, if a company receives a loan from a financial company, that transaction would not be taxed. But, if the financial institution traded the debt, the trade would be subject to the tax. The tax would also cover all derivative contracts, options, puts, forward contracts, swaps and other complex instruments at their actual cost. The measure excludes debt that has an original term of less than 100 days. By setting the tax rate very low, the measure is not likely to impact the decision to engage in productive economic activity. It would, however, reduce certain speculative activities like high-speed computer arbitrage trading. A transaction tax could help to shift Wall Street away from short-term trading. Given the very high volume of financial trading, it will raise considerable funds, badly needed for government services and for reducing deficits. The proposed tax would take effect on January 1, 2013. The European Union is considering a similar proposal, but with a tax rate that is more than three times higher. Today, 30 foreign nations have in place a similar tax, including Great Britain and Switzerland. Various experts are available to comment on this proposal, including Dean Baker, Co-Director of the Center for Economic and Policy Research, John Fullerton, former Managing Director of JPMorgan, Capital Institute and Lisa Donner, Executive Director, Americans for Financial Reform. This entry was posted in Economy on November 7, 2011 by Maui Democrats. Wall Street has its own version: Its Big Lie is that banks and investment houses are merely victims of the crash. You see, the entire boom and bust was caused by misguided government policies. It was not irresponsible lending or derivative or excess leverage or misguided compensation packages, but rather long- standing housing policies that were at fault. 1. Fed Chair Alan Greenspan dropped rates to 1 percent — levels not seen for half a century — and kept them there for an unprecedentedly long period. This caused a spiral in anything priced in dollars (i.e., oil, gold) or credit (i.e., housing) or liquidity driven (i.e., stocks). 2. Low rates meant asset managers could no longer get decent yields from municipal bonds or Treasuries. Instead, they turned to high-yield mortgage-backed securities. Nearly all of them failed to do adequate due diligence before buying them, did not understand these instruments or the risk involved. They violated one of the most important rules of investing: Know what you own. 3. Fund managers made this error because they relied on the credit ratings agencies — Moody’s, S&P and Fitch. They had placed an AAA rating on these junk securities, claiming they were as safe as U.S. Treasurys. 4. Derivatives had become a uniquely unregulated financial instrument. They are exempt from all oversight, counter-party disclosure, exchange listing requirements, state insurance supervision and, most important, reserve requirements. This allowed AIG to write $3 trillion in derivatives while reserving precisely zero dollars against future claims. 5. The Securities and Exchange Commission changed the leverage rules for just five Wall Street banks in 2004. The “Bear Stearns exemption” replaced the 1977 net capitalization rule’s 12-to-1 leverage limit. In its place, it allowed unlimited leverage for Goldman Sachs, Morgan Stanley, Merrill Lynch, Lehman Brothers and Bear Stearns. These banks ramped leverage to 20-, 30-, even 40-to-1. Extreme leverage leaves very little room for error. 6. Wall Street’s compensation system was skewed toward short-term performance. It gives traders lots of upside and none of the downside. This creates incentives to take excessive risks. 7. The demand for higher-yielding paper led Wall Street to begin bundling mortgages. The highest yielding were subprime mortgages. This market was dominated by non-bank originators exempt from most regulations. The Fed could have supervised them, but Greenspan did not. 8. These mortgage originators’ lend- to-sell-to-securitizers model had them holding mortgages for a very short period. This allowed them to get creative with underwriting standards, abdicating traditional lending metrics such as income, credit rating, debt-service history and loan-to-value. 9. “Innovative” mortgage products were developed to reach more subprime borrowers. These include 2/28 adjustable-rate mortgages, interest-only loans, piggy-bank mortgages (simultaneous underlying mortgage and home-equity lines) and the notorious negative amortization loans (borrower’s indebtedness goes up each month). These mortgages defaulted in vastly disproportionate numbers to traditional 30-year fixed mortgages. 10. To keep up with these newfangled originators, traditional banks developed automated underwriting systems. The software was gamed by employees paid on loan volume, not quality. 11. Glass-Steagall legislation, which kept Wall Street and Main Street banks walled off from each other, was repealed in 1998. This allowed FDIC- insured banks, whose deposits were guaranteed by the government, to engage in highly risky business. It also allowed the banks to bulk up, becoming bigger, more complex and unwieldy. 12. Many states had anti-predatory lending laws on their books (along with lower defaults and foreclosure rates). In 2004, the Office of the Comptroller of the Currency federally preempted state laws regulating mortgage credit and national banks. Following this change, national lenders sold increasingly risky loan products in those states. Shortly after, their default and foreclosure rates skyrocketed. Raise taxes on the ultra-rich and corporations. The GOP is filibustering this bill in the Senate and won’t even let it come up for discussion in the House. The Republicans have had their way for 8 years and instead of the wealth “trickling down”, they have destroyed the middle class. According to the C.I.A.’s own ranking of countries by income inequality, the United States is more unequal a society than either Tunisia or Egypt. The 400 wealthiest Americans have a greater combined net worththan the bottom 150 million Americans. This is why people are protesting on Wall Street and all over the U.S. And the protests are working! We’re not hearing so much bluster about cutting Social Security and Medicare from Congress any more. The Democratic Party stands up for the middle class and the working families of America. Join your voice to those who are “Mad as hell and not going to take it anymore”. Sign wave for Jobs not Cuts Sunday Oct 16th at noon on Ka’ahumanu Ave in front of Kahului Shopping Center. This entry was posted in Economy on October 18, 2011 by Maui Democrats. It’s about time we’re talking about jobs. Last night, the President laid out a strong case that Washington needs to set aside the petty politics and take aggressive action to tackle the jobs crisis. That is dead on. We won’t diminish the debt by driving our economy into a double-dip recession or a depression. We have to create jobs both to put a foundation under our families and to restore an economy to battle our debt. This much is clear: no government program is as important to the success of a family as a good job. A good job pays the mortgage or the rent. A good job puts food on the table. A good job feeds the soul. It is unacceptable that 14 million Americans are out of work. That’s 14 million families in trouble. That’s deep damage to communities across the nation. That’s an economy stuck in the ditch. Last night our President laid out a roadmap to get out of the ditch by putting folks back to work. It is a diverse, serious, and substantial roadmap incorporating ideas from both sides of the aisle. So Republicans in Congress have a choice to make. Do they work towards real solutions? Or keep pursuing Mitch McConnell’s top priority of denying President Obama a second term, even if it means costing more Americans their jobs, homes, and savings? This entry was posted in Economy on September 9, 2011 by Maui Democrats. Want to fix Social Security? Lift the cap! As Republicans look to gut Social Security by screaming it’s going bankrupt – they are ignoring one simple solution – and that’s raising the cap. Currently – only the first $106,800 of your income is taxed for Social Security. In other words – Billionaires pay virtually no Social Security taxes, while working stiffs making 40,000 bucks a year carry almost the entire load. At a town hall event yesterday – Republican front-runner Mitt Romney was asked why he doesn’t support raising the cap – to which he responded, “that doesn’t begin to solve the problem.” That’s a lie. According to the Congressional Research Service – just by eliminating the cap – and ensuring that billionaires pay the same Social Security tax rate as the rest of us – the program will generate massive surpluses and stay solvent for at least another 75 years. It’s a simple choice really – have millionaires and billionaires pay the same rate as everybody else – or follow the Republican’s plan to destroy Social Security. Let’s hope our lawmakers choose the solution that helps everyone – and not just the top one-percent. This entry was posted in Economy on August 18, 2011 by Maui Democrats. Thanks a trillion, Republicans. Due to your hostage-taking over the debt ceiling, S&P just downgraded the US credit standing. It means that we’ll have to pay higher interest rates on the money the U.S. is borrowing. Way to go, Republicans, THAT will certainly help us rein in our deficit…paying higher interest…NOT! The Republicans keep talking about fiscal responsibility yet they still keep doing bonehead things like threatening default on U.S. debts to get their way which ends up damaging our fiscal position. 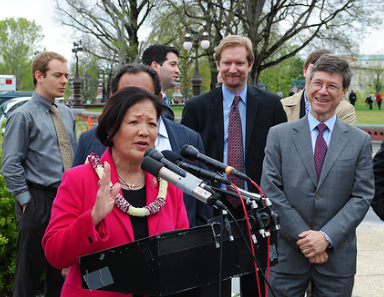 This entry was posted in Economy on August 5, 2011 by Maui Democrats.